The 'Childsmile Programme' is available to every child across Scotland. Children are seen by a childsmile nurse in either a dental surgery, nursery or at school. When Childsmile started, over 42% of children showed signs of decay before primary 1. 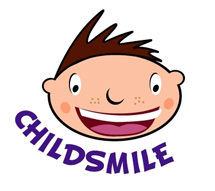 Whitemoss was one of the first practices to be involved with Childsmile when it was part of the initial pilot. This was so successful it has now been rolled out nationally. As a practice here at Whitemoss, we have joined the fight against decay! We have three childsmile nurses - Karen & Kayla. They have all undergone an intense six week training programme and have children of their own so are well qualified in helping and advising parents of young children with dietary and tooth brushing advice. Most children start on the childsmile programme by 3 months old. Parents are given advice on weaning, drinks and brushing. Children can be seen up until the age of approximately 6 years old, although this can be extended. Not only is advice given, other resources are made available such as tooth brushes, toothpaste, drinking cups and leaflets. Everything is there free of charge to help you and your child prevent dental decay. Preventative care is also available, such as fluoride applications and fissure sealants. Fluoride has been proven to reduce the risk of dental decay by quite a considerable amount, as much as 50%. Contact us now for your childsmile appointment, click here.